Please swipe to the right on the blue rates tables in order to view the entire table. A fully furnished and equipped housekeeping cabin, 16′ Lund Boat and Motor, your marine gas topped off once a day, swivel seats, paddles, anchor, wrapping and freezing of fish and conservation fish license. Deluxe Lund Outfitter Boats are equipped with an electric start 60 hp motor, Bow mounted trolling motor, fish finder, pedestal seats, live well, raised floor and bilge pump as well as a fully furnished and equipped housekeeping cabin, wrapping and freezing of fish and conservation license. A fully furnished and equipped housekeeping cabin, 16′ Lund Boat with swivel seats, paddles, anchor, 20hp motor, gasoline topped off once per day, wrapping and freezing of fish and conservation fish license for mom and dad. Trip is for children 6-17. Children 5 years and under are Free! A fully furnished and equipped housekeeping cabin, boat launching and dockage, power outlet for battery charging, wrapping and freezing of fish and conservation fish license. 3-4 day stay in a modern or semi-modern cabin. Conservation license not included. 15 amp, 30 amp or 50 amp electrical service, full sewer and water hook-up, dump station, use of shower house facilities and fish wrapping and freezer service. A 16’ Lund boat with 20hp motor, 2 swivel seats, and your gas topped off once a day. Deluxe Lund Outfitter Boats are equipped with an electric start 60 hp motor, bow mounted trolling motor, fish hinder, pedestal seats, live well, raised floor, bilge pump and your gas topped up once per day. For campground users only. Outlet for battery charging on the dock. Rates are quoted in US funds. Ontario Sales Tax and GST not included. Prices are subject to change without prior notice. Click here for currency conversion. FOR SAFETY REASONS AND TO PROTECT OUR CAMP PROPERTY, WE DO NOT ALLOW GASOLINE TO BE BROUGHT INTO CAMP. ANYONE DOING SO WILL BE ASKED TO REMOVE IT FROM THE GROUNDS. Payment is made by cash, check, money order, Visa, Mastercard or Debit. All cabins rent from Saturday 3:00pm to Saturday 8:00am PLEASE NO EARLY BIRDS!! Reservation deposits are $500 per cabin and are non-refundable, but transferable within the current season. There is a $50.00 service charge for equipment reserved and not used. 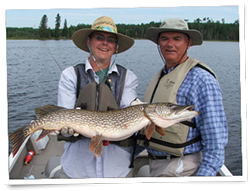 The cost of Conservation fishing licenses will be refunded for guests staying one week in the cabins, upon proof of purchase. We do not allow pets at camp. Due to the high cost of repair and replacement of equipment, guests are responsible for damage to all rented equipment and cabins. We accept reservations on a weekly basis. Early check-out will be charged for the full time reserved. We reserve the right to re-assign cabins according to group sizes. Please bring your own personal life jacket, bath and kitchen towels, dish soap, scouring pads, camera and insect repellent. As an American visitor crossing the border, you will need to verify citizenship with passport, photo I.D. and birth certificate.